A Swedish national police chief said that the suspect in the truck attack is a 39-year-old Uzbekistan native. On Friday, the truck crashed into a crowd of pedestrians in the center of Stockholm. Four people died in the incident, many others were injured. Swedish Prime Minister Stefan Lofven called the incident a terrorist attack. So far, police arrested two men on suspicion of being involved in the deadly attack. The first suspect is a 39-year-old Uzbek national living in Sweden. The man had reportedly posted propaganda related to Daesh terrorist group, banned in a range of countries, including Russia, on his Facebook page. “We have confirmed that he is a man, 39 years old, from Uzbekistan. We have no doubts that we have detained the right person,” Swedish police chief Dan Eliasson told reporters. 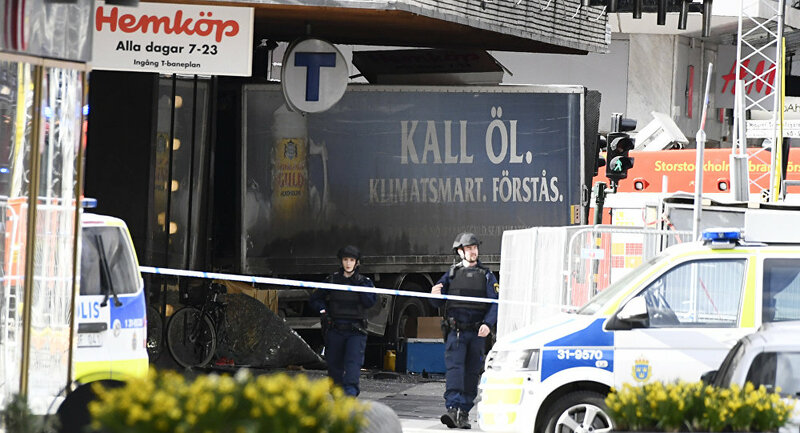 The Swedish police also confirmed that a device was found in a driver’s seat of the truck, but wasn’t ready to call it a bomb. It is unclear yet whether more people were involved in the truck attack, but it is not ruled out by police. The attack in Stockholm “has clear similarities” with the terror incident in London, the police said.